ISBN 9790006450152. 7.5x10.5 inches. Key: D minor. Language: Latin, Text Language: Latin. Preface: Christoph Wolff. Mozart's fragment with additions by Joseph Eybler and Franz Xaver Sussmayr. 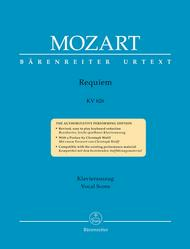 Mozartâ€™s final work, the Requiem K. 626, was left incomplete. The completion of the fragmentary score by his assistant Franz Xaver SÃ¼ssmayr, who helped him with The Magic Flute, has the character of a historical source with utmost closeness to Mozartâ€™s thoughts. Christoph Wolff, an authoritative Requiem connoisseur has supplied a Foreword with a clear and concise account of the workâ€™s genesis and its musical features. * The vocal score has been newly engraved with a generous layout. * The pagination has been adopted from the previous edition. 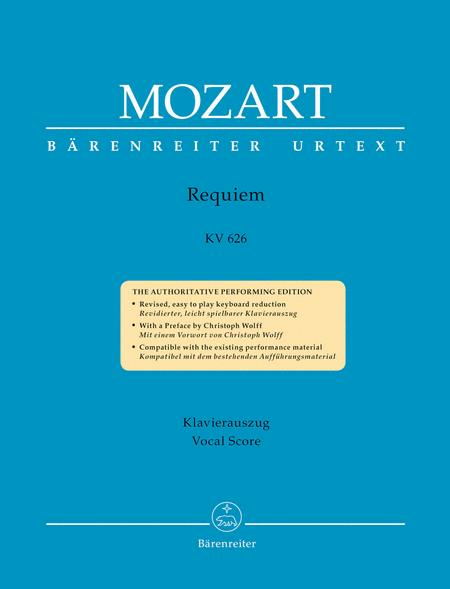 This means that you can rehearse and perform this work with some singers using this new edition and some the old BÃ¤renreiter edition. * This new vocal score includes a revised piano reduction: The old Moehn piano reduction has been maintained, but corrected and uncluttered; on the whole the new piano reduction is easier to read and to play. * The vocal score is fully compatible with all existing performance material (BA 4538). * A more exact spacing of underlaid words has been included in the vocal parts. * The text appears in a slightly larger type size. * The vocal score now contains a Foreword (Ger/Eng) by authoritative Requiem connoisseur Christoph Wolff describing the workâ€™s genesis and its musical features; this text is interesting and accessible not only to professionals but also to amateurs and music lovers. * Apart from corrections the musical text remains unchanged. here, the 2017 edition features computer engraving, and rather poor computer engraving at that. Was not an absolute deal-breaker for me, and this is still the best all-around edition of the Mozart Requiem, but be warned that the engraving quality is not up to the displayed standard here. Excellent music, of course, and this version is easy to read. I was surprised and disappointed to learn that an earlier printing had more in-depth notes about which parts were written by Mozart and what was filled in by Eybler and Sussmayr. That was an excellent teaching tool. Quick delivery once my high school singers decided we'd tackle this magnificent piece. The description online was clear, and the price was excellent. Thank you Sheet Music Plus! March 16, 2016 "Too many notes!" Excellent score, great price (was as high as $49 from some vendors), and fast service. Glad I found this site. Thanks Sheet Music Plus! March 17, 2014 This product makes Mozart easy to read. t take first credit for his heavenly Music! His Music is good for the voice. I rate this Product EXCELLENT. I will shortly order a copy.